Markham Stouffville Hospital is a 215 bed acute care and community hospital serving south-east York Region. 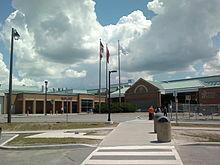 The hospital is located in east-end Markham, Ontario. It is also referred to as a base hospital, as a resource center for paramedics region-wide. HMA provided the security design services for the facility.